"While not pretending to examine the war in depth, "Letters" honestly pictures the curiously two-sided lives of American "advisers" in Vietnam. In the fullest sense of the word, "Letters From Vietnam" is a drama"
"This is a closeup of war perhaps never seen before"
"The face of war has seldom been depicted as graphicly and at such close range as in the face of Army Lt. Gary Ramage"
"It was top-flight action photography, made even more effective by the knowledge that this was for real -- real airmen dodging and catching real bullets from real guns shot by real enemies"
"The battle sequences were arresting, but so were the gentle scenes of officer's concern for the women and children involved"
"It was a film that made us aware of how thoroughly war brutalizes some men "
"An intimate view of Vietnamese fighting"
"The real daring Americans of this show were producer Gregory Shuker and cameraman Abbot Mills...who conspicuously risked their necks in making this film"
"Gutty journalism, photo journalism, developing with artful sensitivity the combat and personal experiences of an American helicopter pilot in Viet Nam"
It is 1964, and two Drew Associates filmmakers are flying daily combat missions with U.S. helicopter pilots in Vietnam. Theirs is a very early film of what became the living room war. 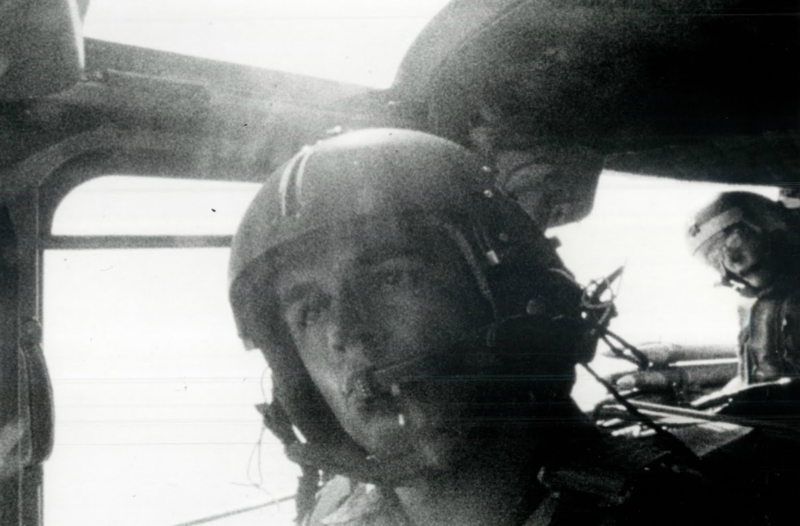 They focus on one pilot: Second Lt. Gary Ramage’s job is to fly low over suspected Viet Cong positions to draw fire so his squadron can pinpoint an attack. The filmmakers, Greg Shuker and Abbot Mills, frequently record under heavy fire. At one point there is a mid-air explosion, which knocks the camera to the helicopter floor as shrapnel sprays. This is the first sync-sound, sustained helicopter combat footage ever shot. The Drew filmmakers fly more than 50 missions with Ramage. In between flights, they film Ramage’s life on base, where Ramage records letters home to his wife and infant son on audio tapes. “We decided before we shot the program that we would need some extraordinary new methods if we were to capture the pilot’s ‘moment of truth,’ his expression in the actual attack and the attack itself,” Shuker said in an interview with Jack Gaver of United Press International, published in the Los Angeles Times on Sept. 8, 1964. Shuker explained how they got the combat footage: first, colleague Dan Drasin went to Texas with a helicopter engineer to design two remote-control cameras. One was mounted on the helicopter’s instrument panel to film back into the face of the pilot and the other was mounted on the landing gear to record the action as the pilot sees it. Shuker and Mills rode in the back of the helicopter belly and filmed with a hand-held camera and operated the automatic cameras by a toggle switch. They also plugged a tape recorder into the helicopter’s intercom to hear the pilot talking on the radio during combat. “Not only in the combat sequences, but throughout this special, I think we’ve managed to come up with something that is a direct experience for the viewer, more than just a report or documentary,” Shuker said.